The notion that the Stradivari workshop also produced the cases in which the instruments themselves were delivered is now widely considered to be fact. As long ago as 1902 the Hills wrote: ‘Possibly […] Stradivari permitted [his sons and assistants] to rough out the work, and went all over it after them […] his assistants may have made the cases destined for the instruments, cases of considerable artistic merit.’  New research is now bringing more light to this relatively neglected aspect of Stradivari’s legacy. The recently updated catalog of designs, models and forms originally used in the Stradivari workshop, exhibited in Cremona’s Museo del Violino, records 71 paper models of case components including latches, keyholes and hinges, almost all of which were probably hand-drawn by the master himself. Only recently another paper model, originally cataloged erroneously, proved to be a template for the interior of a case for two violins, perfectly matching the interior of an existing case attributed to Stradivari (private collection). Why did Stradivari bother with cases, busy as he was making not only violin family instruments, but also mandolins, guitars, lutes and even harps? The explanation is likely to be one of character: all evidence shows that Stradivari was a tireless perfectionist who relentlessly transformed and improved his work and tightly controlled the output of his workshop. Already by the late 1600s he had maneuvered into a dominant position in the market, aided by the demise of the Amati dynasty and the economic struggles of the Guarneris. But instead of resting on his laurels, Stradivari continued to bring his art to the highest level of perfection. Cases were an important part of the delivery of a new instrument to the client who had commissioned it, and only the best would do. What better way to ensure this than by designing the cases himself and having them made under his watchful eye? It is unlikely that Stradivari would have felt comfortable with farming this important work out to third parties, who would have then had the opportunity to appropriate his carefully thought-out designs for their own use. Trade secrets were best kept in the family. These considerations, and the fact that his estate included tools for case making, strongly suggest that Stradivari did not limit himself to designing the cases for his instruments down to the tiniest detail, but probably had them built under his direct guidance by his staff. Cases were an important part of the delivery of a new instrument to the client, and only the best would do. What better way to ensure this than by designing the cases himself and having them made under his watchful eye? Baroque holster cases are particularly rare, with fewer than a dozen currently cataloged worldwide. They have no provision for the bow, no handle and the violin is placed inside by sliding it in scroll-first, presumably first wrapped in cloth, with the bow inserted almost as an afterthought. When the modern violin set-up with its increased neck angle became popular in the second half of the 18th century, these cases became useless because violins could no longer fit inside them. Earlier Italian baroque holster cases possess an interior height of less than 95 mm, while a violin with a modern set-up measures an average of 96 mm when placed on a flat surface. Original baroque instruments have a height of 90–91 mm, allowing a perfect fit in a baroque holster case. 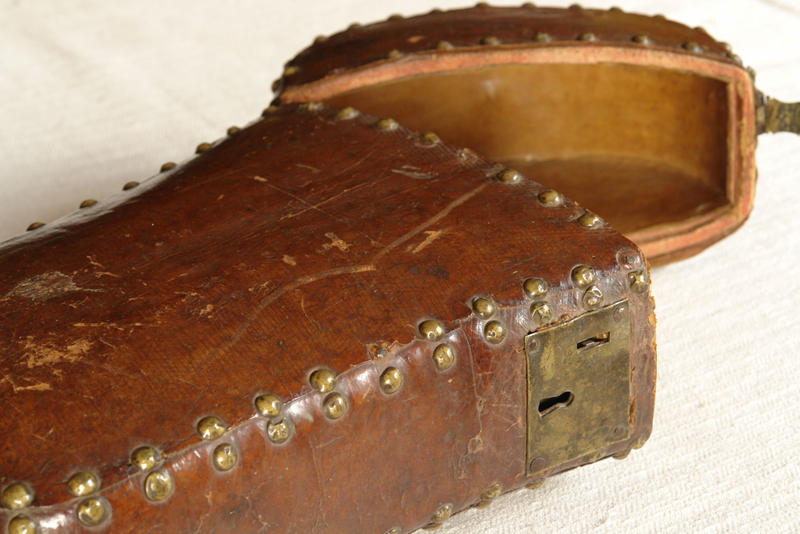 While French holster cases were made from wood formed over an internal mold, as depicted in Diderot’s Enciclopédie c. 1765,  the Italian cases were carved from solid wood, covered outside in leather with protective studs, and lined inside only in paper, and they represent the earliest violin cases that have survived unaltered to this day. It would also seem that the Italian holster cases (including the Milan case) typically possess a rectangular box-section to accommodate the body of the instrument, but then narrow at the neck graft and taper to a perfectly round cross-section, while other cases of the time adopt a tapered box-section for the entire length. In the summer of 2015 news of the existence of a previously uncataloged baroque holster case, part of a private collection in Milan, began to circulate. The case was examined for the first time in January 2016, when it became clear that it bore a striking resemblance to another holster case, in the possession of the Chi Mei Museum in Taiwan, which is thought to have been made by Antonio Stradivari between 1680 and 1690, making it a valuable point of reference. Comparison of the measurements gave a perfect match between the Milan and Chi Mei cases, with almost all primary and secondary dimensions, including the thickness of the shell, either matching perfectly or varying up to 1.1%. To put this into perspective, two other seemingly identical holster cases in the Castello Sforzesco Museum in Milan have almost no matching measurements, with some differences measurable in centimeters. This is significant because while the basic measurements of a case depend on those of the violin itself, the secondary measurements, which are not so linked to function, depend more on the individual design of the case. The lid and back can have a fuller or flatter arching, a greater or lesser thickness, and a more or less stylized violin pattern in proximity of the upper bouts. As these cases are wide at one end and taper towards the other, the taper can be more or less pronounced, and the overall sections can be boxier or rounder. The exterior of both the Milan and the Chi Mei cases also suggests they were made in the same workshop. Both are covered in Moroccan leather of similar quality, crosshatched to permit adherence to complex surfaces, while more clues are found in the placement of the brass studs that protect the leather joinery. These hand-beaten studs, which are 10 mm across and placed in both cases in pairs every 25 mm, were originally hand gilded according to Wood. The only significant difference between the two cases is that the Chi Mei case possesses an intricate gold-leaf decoration on the exterior, which the Milan case lacks. 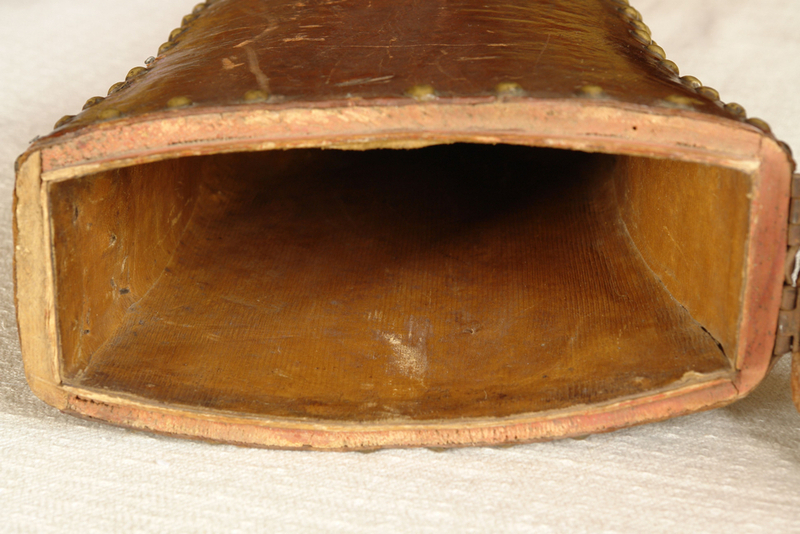 A ring on the wider extremity of both cases allows the attachment of a strap; the opposite end of the case shows holes where another ring may have been present, as in the Chi Mei case. The shell of the Milan case is carved out of spruce and what appears to be poplar, the latter of light weight and abundant in the Cremona region, but we cannot compare it to the Chi Mei one as the latter was lined at a later date, concealing the structure. It would appear that the Milan case retains its original form, with the probable exception of the latch, coincidentally almost identical to that mounted on one of the two holster cases at the Castello Sforzesco. The interior still retains its paper lining and was not later covered with cloth as almost invariably occurred with baroque cases. The studs also seem original, as they exhibit the same amount of hand-beating and a few are missing; other baroque cases often exhibit suspiciously new-looking studs. Fortunately this case was not subjected to a 20th-century ‘restoration’, with improbable felt linings in garish colors and posthumous bow spinners, a practice which has compromised so many other baroque cases. In conclusion, the Milan case provides a useful point of reference in the process of identifying and attributing other cases made in the Stradivari workshop. The ratio of currently attributed cases to the number of instruments built by Stradivari strongly suggests that there may be others awaiting discovery. That said, as an early Amatisé Strad evidences fundamental differences when compared with a Golden Period example, we cannot expect all the cases made in the Stradivari workshop over his 70-year career to exhibit the same characteristics. Further research will be necessary in order to identify the master’s telltale signs in his case production. Dimitri Musafia studied violin making in Cremona and established his case making company there in the 1980s. W. Henry Hill, Arthur F. Hill, Alfred E. Hill, Antonio Stradivari, His Life and Work; New York, Dover Publications, 1902. Dr Glenn P. Wood, Art and History of Violin Cases, Authorhouse, 2008. Denis Diderot et al, Enciclopédie, ou Dictionnaire Raisonneé des Sciénces, des Arts et des Métiers, pub. 1751–1780. Simone F. Sacconi, I “Segreti” di Stradivari, Libreria del Convegno, 1979. Andrea Mosconi and Carlo Torresani, Il Museo Stradivariano, Cremonabooks, 2001. Dr Glenn P. Wood, Violin Cases: History and Development from the 17th to the 21st Century, VSA Papers, Journal of the Violin Society of America, 2006. Fausto Cacciatori, Antonio Stradivari – Designs, Models, Forms, Edizioni Museo del Violino, 2016. Alexis Legrosdidier, Creativity in Modern Violin Making, Liuteria Musica e Cultura, Journal of A.L.I. Italian Association of Violin Making, publication forthcoming.